Over the past decades, the vast sheath of frozen seawater known as Arctic sea ice, floating on the Arctic Ocean and its neighboring seas, has been affected. Its extent has shrunk, the oldest and thickest ice has either thinned or melted away. This has resulted in the sea ice cap becoming highly vulnerable to the warming ocean and atmosphere. What we’ve seen over the years is that the older ice is disappearing. This older, thicker ice is like the bulwark of sea ice: a warm summer will melt all the young, thin ice away but it can’t completely get rid of the older ice. But this older ice is becoming weaker because there’s less of it and the remaining old ice is more broken up and thinner, so that bulwark is not as good as it used to be. As direct measurements of sea ice thickness have been erratic and incomplete across the Arctic, scientists have developed estimates of sea ice age and have tracked their evolution from 1984 to the present. 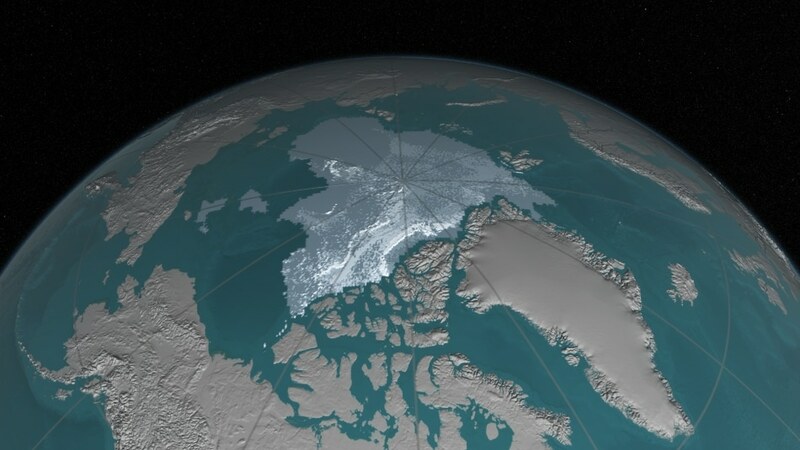 A new NASA visualization of the age of Arctic sea ice reveals how sea ice has been growing and shrinking, melting in place, spinning, and drifting out of the Arctic for the last 30 years. Ice age is a good analog for ice thickness because basically, as ice gets older it gets thicker. This is due to the ice generally growing more in the winter than it melts in the summer. In the early 2000s, researchers at the University of Colorado developed a technique to monitor Arctic sea ice movement and the evolution of its age using data from a number of sources, but primarily satellite passive microwave systems. These systems gauge brightness temperature: a measure of the microwave energy released by sea ice that is influenced by the ice’s temperature, surface texture, salinity, and the layer of snow on top of the sea ice. Each floe of sea ice has a distinguishing brightness temperature, so the researchers formulated an approach that would spot and track ice floes in consecutive passive microwave images as they drifted across the Arctic. The system also used information from weather data and drifting buoys. Annually, during winters the sea ice forms and melts during summers. The sea ice that survives the melt season thickens year after year: newly formed ice grows to approximately 3 to 7 feet in thickness during its first year, while multi-year ice is approximately 10 to 13 feet in thickness. The older and thicker ice tends to be more resistant to melt and less likely to be influenced by winds or broken up by storms or waves. In addition to shrinking in surface area in recent years, the Arctic sea ice is becoming thinner and younger as well. Cryospheric scientist Dr. Walt Meier of NASA Goddard Space Flight Center states that the sea ice has undergone fundamental changes during the epoch of satellite measurements. On a week-to-week basis, there are weather systems that come through, so the ice isn’t moving at a constant rate: sometimes the Beaufort Gyre reverses or breaks down for a couple weeks or so, the Transpolar Drift Stream shifts in its direction … but the overall pattern is this one. Then the spring melt starts and the ice shrinks back, disappearing from the peripheral seas. In a recent animation two main bursts of thick ice loss is shown: the first one which began in 1989 and lasted a few years, was because of a switch in the Arctic Oscillation, an atmospheric circulation pattern, which shrunk the Beaufort Gyre and boosted the Transpolar Drift Stream, pushing more sea ice than normal out of the Arctic. The second peak in ice loss started in the mid-2000s. Unlike in the 1980s, it’s not so much as ice being flushed out –though that’s still going on too. What’s happening now more is that the old ice is melting within the Arctic Ocean during the summertime. One of the reasons is that the multiyear ice used to be a pretty consolidated ice pack and now we’re seeing relatively smaller chunks of old ice interspersed with younger ice. These isolated floes of thicker ice are much easier to melt. We’ve lost most of the older ice: In the 1980s, multiyear ice made up 20 percent of the sea ice cover. Now it’s only about 3 percent. The older ice was like the insurance policy of the Arctic sea ice pack: as we lose it, the likelihood for a largely ice-free summer in the Arctic increases.